My husband and I took a moment to watch our son asleep this morning. He was wrapped in a tangle of sheets, unwilling to release his firm grip on a tiny piece of plastic that looked to be a lego piece. His handsome face was peacefully inhaling and exhaling deeply and not quite snoring. His arm was up in a position that made it clear he did not so much drift off to sleep; rather, his body won the battle to rest and recuperate against his iron will to keep moving. Ever darkening peach fuzz above his lip does not detract from the innocence of our son's face in sleep. These are the moments when I catch my breath and wonder how I was part of producing such a lovely human being. I have a difficult time understanding how people fail to see him as we do. What a hellish year its been so far. So much we are trying to shield him from, so much hate, harm and pain. Surrounded by all the danger and uncertainty I was so sure our nation would outgrow, I can say the only things I feel positive about are that we love him, that autism is not an anthropomorphic demon "with" him, dogging his steps, waiting to trip him up, and that this will of iron he has had since infancy is actually becoming steel, forged in the fire of these horrific adversities life keeps throwing in our paths. I'm positive I belong beside him, guarding his flank against the racist, ableist, ignorant, hateful and well intentioned enemies that stand between him and his rightful place in this world. I am positive he is not a burden. I am positive of his right to be part of any community he lives in. that intimidate the uneducated have never bothered me. I'm not sure why that is. I call him my Pan-Turkish American Pehlivan. I sing songs to him about John Henry and Kiziroğlu Mustafa Bey and tell him that those who were like him never gave up; they commanded respect and he should do the same. My concern continues to be that he should be allowed to participate in life as anyone would. Autism shouldn't be something he's "with", like a vaudeville ventriloquist's dummy in a suitcase that is carried with him, attached to an arm. Our son's neurology is a descriptor of who he is like any other adjective we use to try and define him. He is American/Nonspeaking/Turkish/Hispanic/Black/Indigenous/Autistic/Obstinate/Charming. He is all that and yet more than the sum of all. He defies description. He reflects and refracts each aspect of himself. That is who his is. Sometimes I see him pounding down the stairs they said he'd never climb without support or laughing, jumping wildly in the sunlight and laugh with the sheer joy he taught me to express fully. I pity those who don't see him as I do. Perhaps it is the same as gazing too long at the sun. Maybe they should learn to not look directly at him just as he, in deference to not seeing their souls' secrets bared, does not look into their eyes. Realities can be overwhelming. The hardest thing about being Mustafa's mother is people around me projecting their own ableism on me and telling me how I should feel about him. I shouldn't be happy because they wouldn't be. I must accept that he is an unacceptably divergent son, because they cannot accept him. I must be near some breaking point because were they in my position they would be. They have no idea. They just assume they do. Their forcibly imposed conclusions are the most difficult thing to fight each day. 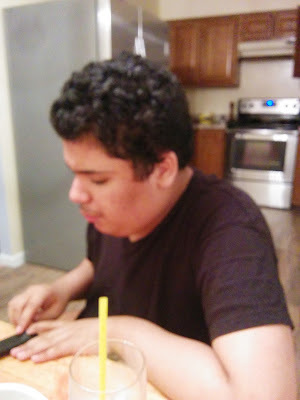 The time consumed countering all that insistent negativity about nonspeaking autism could be better used just getting to know my budding teenaged son. When a word or short sentence bubbles its way to his lips it is a sweet jewel because verbal speech is nearly impossible for him. I know. I've seen the scans of his brain. His voice, a deeper richer combination of a voice I inherited from my mother and her ancestors, the voice our daughter has in a slightly higher pitch, is heartbreakingly beautiful. If Mustafa ever sings it will be something to hear. But that doesn't matter to me now. I just want him to be given the respect he deserves. He has inherited something I did not wish to give my children; I don't mean an autism gene. I mean a legacy of being a marginalized human being in a negative world. Acceptance? Acceptance is not enough.